For some objects, i.e. machine parts some data necessarily has to be known for a correct usage. For example, this might be an id, the name of the manufacturer or a list of ingredients, necessary for recycling. Those pieces of information should be kept together with the object. Tags attached to the surface are easy to read and to write but may be removed from the surface easily or may get lost. Thus, new ways for inherent data storage have to be found. The project is dealing with a lot of different methods and searches for new applications. Our part of is to store data by using micro structures on drilled metallic surface. The structures are created during the drilling process. They consist of a groove with varying depth wrapped around the cylindric mechanical component. Our task is to develop the data storage system. This includes choosing proper coding techniques and modulation methods for the writing. 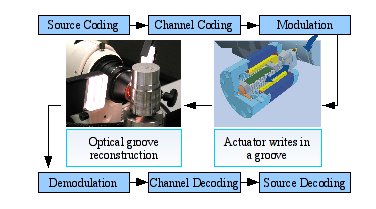 The main focus lies in developing an optical readout method to reconstruct the micro-structured surface. More precisely the depth run of the groove written in is determined. For the whole storage system, the standard model for digital data transmission over a channel is used. Only the channel, where data may be disturbed or corrupted, differs from ordinary data transmission. Here it consists of the actuator's writing, the transmitted signal on the component’s surface and of the optical readout, which represents the reconstruction of that signal. The advantage of using this standard model is that source coding, channel coding and the modulation method may be re-used from existing systems. Our main approach uses the reflectance properties of the metal surfaces. 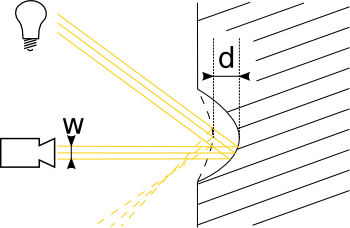 Under the influence of directed light, depending on the position and orientation of the camera, surface parts with a specific steepness and orientation have maximal intensity. 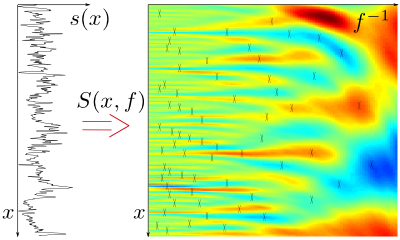 Thus, the depth from the groove is correlated to the width of the reflecting surface parts. In the first step of the readout method, multiple surface images are stitched together to a cylindric projection of the mechanical component's surface. 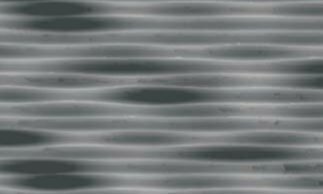 Next, the position and orientation of the groove is determined by evaluating the Power Spectrum Density of the image in vertical direction. Finally, the run of the groove is tracked with a Hidden Markov Model with a special regular topology.